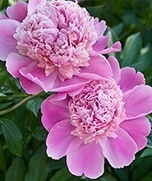 The charm of perennials is that each month brings new blooms to enjoy. These plants are the backbone of your flower garden because they have staying power. Their leaves usually die back as winter approaches, but with luck, they will come back each year. 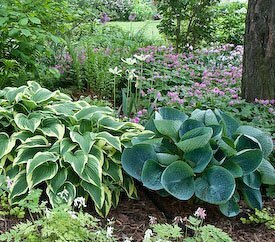 Some are short-lived, but old favorites like daylilies, hostas and peonies can thrive for decades. 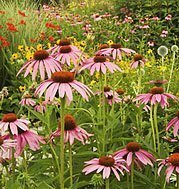 When designing your flower garden, there are many choices to make. Some are purely aesthetic (such as match-making plant combinations and colors), and others are horticultural (what grows best in conditions on your property and in your climate). The more closely you base decisions on meeting the needs of your plants (light requirements, hardiness, soil and moisture levels), and on which plants look good together, the more successful your garden will be. 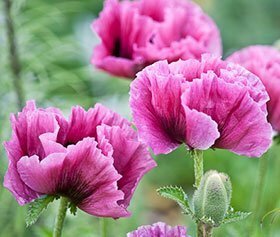 Plant information: In the left-hand column, you’ll find links to many flower garden favorites for sun and shade, complete with growing and care tips. When you start out, you may think that all you have to do is get your plants into the ground, and with the exception of weeding, watering and cutting them back each season, your garden will be done. The first year your new perennials are underwhelming – the clumps small, the flowers sparse. By the second year, you’ll see more flowers and better growth. But in the third season – watch out – your plants look like they’re on steroids, and you look like an accomplished gardener. After that, many plants get bigger each season, while the odd one does a disappearing act. Responding to inevitable change is the challenge – and that’s why veteran gardeners often say that no flower garden is ever really finished. Fall-bloomers – The season may be coming to an end, but why should your flower show stop early?